Well...I am running out of soap, so I need to make more! 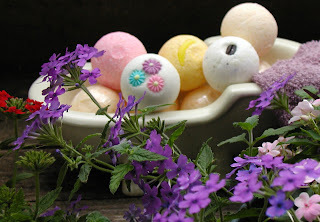 I have been a soap and candle maker for about 10 or so years:) I quit doing that a few years ago..in 2008 to be exact. But this week I have been thinking..I really do need to make some soap. I was looking thru some pictures and I found his one...Bath Bombs!! They were so much fun to make and the picture made me smile, so I thought I would share it!